In 1930, Varick Frissell traveled north to Canada to make what would turn out to be the deadliest movie ever. Twenty-six people would die in the filming, including Varick Frissell himself. The film was a drama set aboard a fishing ship in White Bay in Newfoundland. It dealt with the friendship and rivalry of two men, one of whom is convinced he is a jinx. As the story plays out, the men must survive being marooned on the ice after their ship, the Viking, is destroyed during the Canadian seal hunt. Frissell was born in Boston in 1903 into a well-off banking family. He was educated at Yale, and spent time volunteering doing charity work in Newfoundland. On his travels north, Frissell shot footage for two documentary films - The Lure of Labrador and The Swilin' Racket (a local term for seal hunting). The films were well-received and the Paramount movie studio offered to fund a commercial version of the films that would highlight the lives of the fishermen. By 1930, Frissell had completed most of the filming on the movie, with the working title White Thunder. But Frissell wanted to add a few more scenes of the ship at sea. So he and a movie crew traveled to Newfoundland and boarded the Viking to shoot the final frames on White Bay. It was March 15, 1930. Crew and passengers aboard the ship Viking reported concerns about the way blasting powder was being handled. Some had spilled on deck, and men were smoking near it. As most of the people on the boat were below decks attending a church service and singing Nearer My God to Thee, Frissell was on deck fastening a danger sign to the deck house that stored the explosives. Frissell and two others had been filling canisters with powder, anticipating that they would be blasting the following day. Ships working in the waters off Newfoundland carried powder to blast through ice jams when they got caught up in them. A witness later said that one of the men working with the powder was smoking a pipe when an ash fell into some spilled powder. The explosion at the stern of the ship split its hull and toppled the masts. Nine casks of kerosene caught fire. The 27-year-old Frissell was last seen trapped in the rigging of the fallen mizzen mast, shouting for help. Word of the disaster reached the United States, and the number of dead was, at first, unclear. A Connecticut short wave radio operator reported that a priest in Newfoundland had radioed that Frissell and the movie crew were alive, and newspapers across the country carried the headline: "Frissell Safe." However, as survivors began to reach land the fate of Frissell became clearer. One-hundred eighteen passengers and crew on the ship managed to escape to the Horse Islands by walking across the ice. They were rescued by other fishermen, but Frissell was not among them. Frissell's father hired daredevil pilot Bernt Balchen, who had experience flying arctic expeditions, to search for his son. But no signs of Varick Frissell ever surfaced. 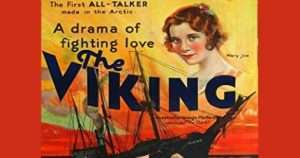 In 1932, Frissell's film was released under the title The Viking. The film's producers weren't shy about using the disaster to promote the release of the film. Newspaper ads and movie posters noted: "This is the picture that cost the lives of Varick Frissell and 25 others in the Sealer Viking Disaster." Howard Hughes promoted the opening of his new chain of movie houses with billboards that announced: "26 men died to open the Hughes-Franklin Studio Theatres." The promotion was criticized as "a hideous attempt to commercialize" the Viking disaster. Hideous but probably quite successful. The Viking was burned to the waterline in the disaster, and it sank. Frissell's body was never found. A grave memorial for him is located in Middletown, R.I. You can watch the Viking online here.